Anne Aleckson and Step up to JOY! bring you the following Energy tools to raise your vibration so you can live a happy, abundant life of daily ease and flow. A guided mp3 to help you pump up your vibrational energy around any situation you are currently facing. Can't decide where to put your business focus? Not sure what your passion is and how to tranform it into a profitable business? Lost that loving feeling with your partner? Sick and tired of your kids not doing what you ask? 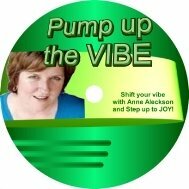 Pop the mp3 on and change your energy.